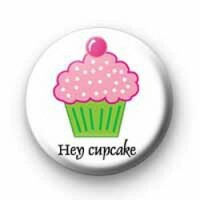 Cute kitsch cupcake button badge in white with a big pink cupcake and the text hey cupcake beneath. This super cute cupcake badge is perfect for those of you who love to bake (or just eat cupcakes). The pink cupcake on the badge is contrasted with a lovely green cupcake case. We have a good range of baking and cake badges available. All of our badges are 25mm button badges & we hand make them all to order from our workshop on the Cornish coast.